An evaluation of user preferences (Special:Preferences) in MediaWiki core. I'd suggest using 1% as an aggressive cut-off for initial culling and then deciding whether we want to go beyond that. If a pref/feature is used by fewer than 1% of active users, and doesn't have accessibility implications, it's really hard to justify its continued existence. The External Editor/Diff pref/feature. While the External Editor capability is also surfaced on file description pages, I think based on the tiny usage it's safe to remove it entirely. It was always a hackish approach (by yours truly no less), doesn't rely on the API, and should just die. Perhaps a better approach can be found in the long term, perhaps not. Some of the watchlist filters. "Hide logged in users" (used by 33 users), "Hide anonymous editors" (used by 44 users), perhaps "Add pages I delete" (used by 151 users). The ability to disable the Table of Contents feature (used by 86 users). The ability to disable section editing (used by 86 users). The ability to disable the collapsing of sidebar navigation menus in the Vector skin (used by 261 users). 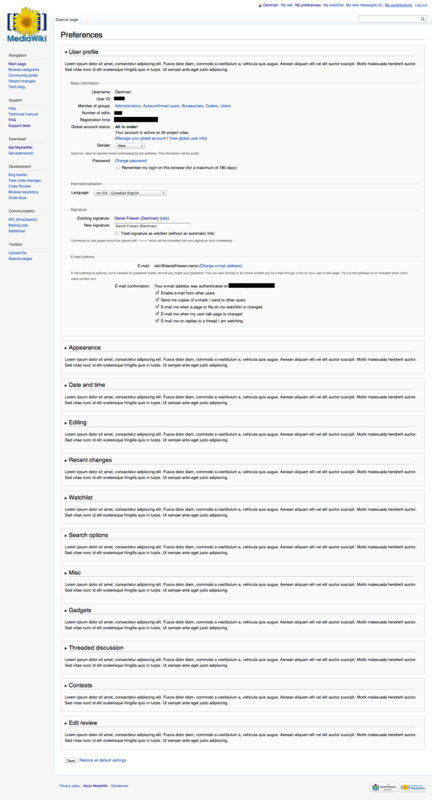 The ability to disable AJAX search suggestions (used by 112 users). The ability to render preview below the edit box (used by 372 users). What is 1 % in absolute terms anyway? And shouldn't it be computed only on the total of users who ever set a preference, to avoid counting the "silent majority"? I personally have used two of the above, and would like to see them kept. When manually doing repetitive tasks, especially on a slower connection, I find "The ability to show diffs without rendering the corresponding page content" very useful. It's not something that I need all the time, though, so I can understand why it would have a lower apparent usage. "Enable section editing via  links" - I always have this box unchecked. I never use the section editing feature. I understand how it can be useful to some, but, especially on talk pages (and let's not talk about edit conflicts) I've found it confusingly problematic. And this preference removes extra links from needing to be loaded on the page. Tabs on top still a good idea? Kind of stack weirdly. Maybe need vertical tabs in a sidebar thing? Stats about usage of these preferences is desperately needed. Language option — move up to top? E-mail preferences are weirdly situated... combine into a generic "Communications" section? Skins should surely be using a dropdown menu? No, no, no, no, no, no, no, hell no... that would eliminate the preview link, the other links there to help the user, and it would preclude us from trying to make the interface more usable in the future by using things like screenshots. gerrit:27201 Link underlining — gadgetize? Threshold for stub formatting — gadgetize? gerrit:27202 Disable browser page caching — why does this option exist? Show hidden categories — always show for logged in users; kill user pref? gerrit:27206 Justify paragraphs — gadgetize? See also Requests for comment/Reduce math rendering preferences and bugzilla:36496. Can't all of the date and time formatting be done in JS? Move time offset to user profile section? Show preview on first edit — gadgetize? gerrit:27258 Enable section editing via  links — why is this a user pref? gerrit:27197 Mark all edits minor by default — gadgetize? Prompt me when entering a blank edit summary — gadgetize? Yeah... it enables livepreview. ie: ajax preview. Enable input method — wtf does this even mean???? The WikiEditor extension adds this section and its two prefs. English Wikipedia names this section "Usability features" (with message prefs-beta). Enable enhanced editing toolbar — stop supporting the old toolbar; come on; gadgetize? Hmmm. Another per page results option? Hmmm. Why does this tab exist? Random diffs section... related to editing? Put it in that tab? WikiLove should be a gadget, surely. Show a link to My Contests in the user menu. A whole tab for this? Seems disproportionate and excessive. Really outside the scope of this RFC, though. Krinkle should make that magical searchable gadget repository thing he was talking about. Unless that was someone else. But whoever it was... well, that would be useful. A lot of the more random preferences would go well dumped in a searchable repository, along with a whole slew of rather bizarre user scripts. And some not even remotely bizarre ones, for that matter. Also, we should be careful when considering gadgetising commonly used things and accessibility features, if there are any. I'd also mention things added for the sake of compatibility, but chances are most people will have no idea what they mean and thus having an extra tick box with the main stuf won't actually help anything for them. We're talking about removing user preferences, but what about "hiding" them by default? Some programs already follow the convention of having an option to "turn on advanced options", so advanced or obscure options are hidden by default to newbies who still may not understand what they actually do, and advanced users can enable them. So, if I didn't miss anything, the rationale for the removal of user preference is to not overwhelm the user with so many options by one side, and probably delete some of them so they don't need to be taken into account when making changes to the code. The first part can be done by just hiding them, and yet allow advanced users to use them. Then we could argue which of them are useful at all and may be removed. Strong support. "Show Advanced Options" is a widespread interface option. w:Progressive disclosure. Because: We need Photoshop for powerusers, as well as MS Paint for the newcomers and casual editors. MS Paint is great! It's Welcoming, and easy to learn via experimenting, and easy to create simple (sometimes even complex) projects in! Photoshop is great! A dense abundance of menus, with a profusion of tiny and detailed-metadata, for those who need it! For those who spend hours, every day, for many years, working *hard* within it. This page was last edited on 31 March 2016, at 05:50.